Published: Nov. 23, 2016 at 10:17 a.m. Updated: Nov. 23, 2016 at 03:10 p.m. The holiday shopping season has arrived. Again. I'm here to help. First, a bit of unsolicited advice: Don't even think about going to the mall or any of the big box stores on Black Friday. There are roughly seven million YouTube videos that explain why this is a bad idea, and besides, it's 2016 -- the internet is your friend. Stay home, get drunk, memorize the three-digit number on the back of your Visa. 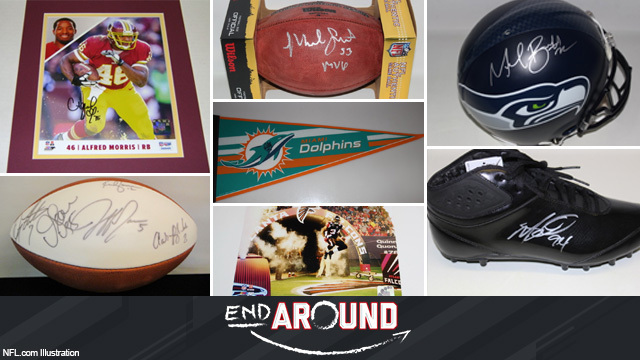 Because I'm a good dude -- and because my editor wanted a themed column this week -- I took the time to go through every single item on NFL Auction for the express purpose of locating fun gifts for the special football fan in your life. I've done the legwork; all you have to do now is be the highest bidder. Let's get to it. I enjoy the title here. Could have cut down on the wordiness with a simple: "This s--- won't work." Personally, I'm only interested in the headset McCoy was wearing when he almost had that nervous breakdown last month. You know the one, right? I prefer all my electronic communication devices to have a complicated back story of angst and self-doubt. In service of fair commerce, the seller should disclose that this ball washed up on a beach in Hawaii two weeks after the 1999 Pro Bowl. We're about seven years away from, "Who was named MVP of the Seahawks' victory over the Broncos in Super Bowl XLVIII?" becoming the biggest trick question in NFL trivia. Buy this ball and you'll always remember the answer. Speaking of the Seahawks, this helmet is special because it will constantly tell you how underpaid it is for two months every summer. OK, so, yeah, not all of these suggestions are actually good gift ideas, per se. But I just want you guys to know that for less than a price of a meatball hero, you can have this (pretty cool) picture of former Falcons fullback Ovie Mughelli. This fills a specific but important niche: Monster Derrick Shelby fans who want to honor his four-year career with the Dolphins and feel their living room could use the pop that a premium pennant brings to any wall. This is cool because owning these cleats will allow you to tell friends that you, too, have quit on Rex Ryan. At least, by proxy. I feel like this would be a great gag gift if you were buddies with Ryan Tannehill. Bids would skyrocket if you could somehow package this ball with the opportunity to be verbally assassinated by Miko Grimes for 10 minutes. In a previous edition of Tales From NFL Auction, I spotlighted what I assume is the same Doug Marrone football. They just cannot move this product. If I were an NFL Auction decision-maker, I'd duct tape a $20 bill around the sucker and try again. Fun fact: NFL Auction is absolutely overflowing with Pro Bowl uniform inventory. It's almost like when the game ends, everyone takes off their Team Rice and Team Irvin gear and literally never thinks about it again. True story: This is the only remaining physical proof that Jonas Gray existed. Belichick destroyed all evidence of Gray's 201-yard, four TD game after he overslept. I've heard Dante Scarnecchia had one of his union buddies bulldoze Gray's childhood home. For the bully, reformed bully, or Ferrari critic in your life. Admit it: You had absolutely no memory of Reggie Bush ever being on the 49ers. It's OK; he probably forgot, too. If you look at Mack's signature in a mirror it reads: "PLEASE SEND HELP. DAWG POUND IS KILL SHELTER." Hey, remember Rodney Hampton? He was a guy for awhile there. For the misguided Bears fan in your life who wants to get in on the Cutler-in-Chicago stock at its lowest. Cigarette not included. Follow Dan Hanzus on Twitter @danhanzus and check out his stuff on the End Around.